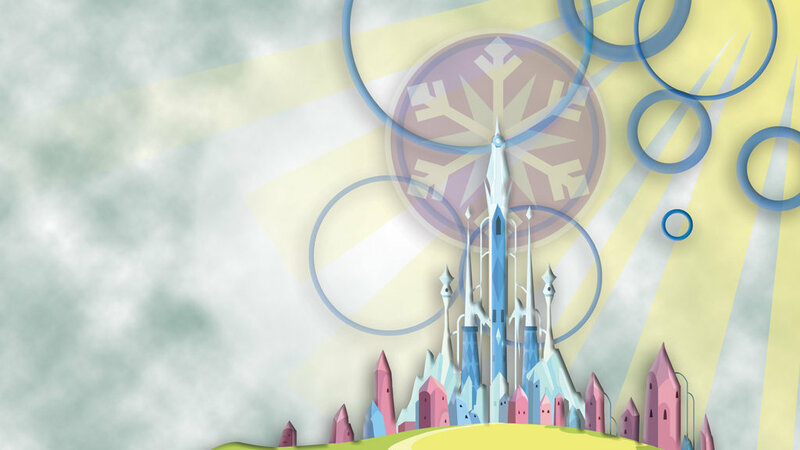 It is high noon in the shining capital of the Crystal Empire, the purple and white white flag flying high. The citizens are peacefully going about their days, when the bell sounds making their shiny skin darken in fear. They run inside, except for the few, the brave, the strong. The Crystal Guard. They charge into battle against the vicious changelings, sounds of their battle can be heard all over. Your role in this? While the Guard can act as a big target, you will sneak around and take out more threatening enemies from behind. Should you find a queen commanding them from back there, you are to prioritize killing her: these creatures should be useless without a leader to coordinate them. Okay, where are we exactly and where is our enemy? You are in position at the south side, The guards have the changeling horde occupied for now and have drawn them over to the east side facing them north.. so you can proceed to flank them and cut down the most threatening of the horde. The buzzing of their grotesque wings is loud, like a swarm of bees. You can spot a target from here actually, a larger changeling, with some kind of heavy armored shell, unfortunate for him that stupid shell slowed him down enough that you can make sure he never touches the city. Improvise, Glorify on Rose Shard. "Foul creature! You will never step one foot in our holy city!" The beast turns with surprising speed attempting to slam his outrageously large shell into you, but Cobalt Bar pulls you both back before it can land. vanguard "No need to thank me ladies." he smirks "Just doing our job." Smirk, turn around and pull out my lyre, Inspire! "You can boast when we're at the afterparty!" he spots your lyre and seems to understand that it would be helpful, he targets you specifically ignoring everything to barrel into you. You notice how heavy he actually is as you nearly buckle under the weight. Cobalt and you work in perfect harmony, he knows when its time to get serious. Utilizing the Changeling's focus on Peaches, you attack it unopposed with a leaping strike, breaking its obnoxiously large shell into pieces. As the changeling lies exposed and shocked Cobalt slices and dices the vermin. The target is down and wounded but seems to still have some fight left. your shiny skin lighting up in pride at your teamwork. You feel cool relief as you bath yourself in a healing light. You slam down on the target with righteous fury while Cobalt covers you. You keep slamming until the bug's eyes go completely out and legs have stopped twitching. Its organs are now usable for any kind of study, unless you wanted to study what changeling paste taste like. You crystal skin continues to shine so bright, no one can even see the blood splatter on your skin. Just the pretty Crystal Pony..
"Up ahead. I see the next target." Cobalt informs you. There is a Changeling leading 4 others, but it doesn't look like a queen, too small. It has a kind of purple mane on it, and green eyes. Inspire this team of poor bastards! "It's an infant Queen. Kill it!" You swish, swing and miss past a changeling drone who bites your hoof. Cobalt gets his part done, slicing at the purple maned changeling. "Our enemy is weak and his will almost broken! Never falter!" Shout to the purple maned changeling "What the hell are you?" Your words ring very true for Rose Shard, who seems more confident now. "I am Fel Horn. I have seen you before Crystal Pony.. In a dream? A vision? Doesn't matter.. I know how to beat you already." Cobalt tries to silence her but is met with a green bolt to the face. You feel extremely confident that your next action will succeed. That gotta hurt, fix it. "And I know how to beat you. Cobalt goes for a drone but Fel Horn keeps pressing on him "You rely on this one, I've ssseen it" she hisses as she fires more green magic at him. "If I take thisss one away.." Cobalt looks dazed and dull as he falls to the ground. In pure rage you charge her with your hammer and shake the foundations of her core, she falls down helpless and looks.. scared.. "I see.. but what If.. I was him.." she now resembles an exact replicate of Cobalt. "Hey, partner, help me up won't ya?" your coat is shimmering again, cobalt (both of them) have dull coats. you throw out the best healing spell you've ever done, and Cobalt is even better than before, springing to his hooves. "Ah, sweet peach, thanks for the boost, but what am I doing over there?" he points to the duplicate of himself on ground. the four changeling drones decide now is a nice time to act, and deal damage. 2 to peaches and 2 to Cobalt. "They're trying to distract us? Pathetic." Cobalt says. Headbutt one of them to get it off, then drive my dagger into it! Surely I know who the real Cobalt is! Smash with the hammer the helpless one. "You won't fool me, your black heart betrays you!" You twist your dagger into the drone, is staggers back, breathing heavily. However you take damage from an unopposed drone. "Aw, come on, you know its me.." you hesitate, This face, that voice.. its your Cobalt's, you flashback to when you first met.. The Cobalt in front of you stands up his hoof on your shoulder "Thanks Rose Cheeks. Let's hurry with our mission now." Cobalt finishes off one of the drones, and the other strikes him in spite. Nope out pretty hard and heal myself. you take damage from the two changelings that were after you, and fall helpless. there, you smash apart a drone, and look worriedly over that Cobalt and Cobalt locked in combat. They switch places several times and one of them pins the other.. but which ones is which. "Which one is the real you?????" you put that hammer to good use and knock a drone away from peaches. "I'm the real one, Don't you believe me?" the Cobalt on top says as he slams his hoof into the other Cobalt. "Please, don't listen to her, I'm the only me!" The bottom cobalt looks very damaged. Quick, Heal Cobalt Bar! The one on the ground! the drone moves bit faster than you and punches you in the face. The one on top makes an odd face at you as it keeps punching the bottom one "We can talk about that later can't we?" coughing up a bit of blood the bottom Cobalt "Room 310.. at the academy.. Now, hit her already!" You heal the bottom one, better safe than sorry I suppose. Heal also restores hits, helping up whoever is down. And now, smithe the last damaged drone! as you try to attack, the last drone launches at you, causing you both to tumble, you crash onto the ground and stare up at… yourself?" launch yourself and the top cobalt away swiping at its leg with your hammer, he seems to be limping a bit after that hit. "Wha-what are you doing?! The Mighty Fel Horn is going to get away!" he gets to his hooves. You spring to your hooves, the other you stands aggressively and does not speak. The limping Cobalt looks frightened "come to your senses Partner. Its me.." you come down hard on his other leg leaving him helpless.. and revealing that it was Fel Horn all along, her green eyes have that marks of panic in them. After I heal myself, pls. You cast a heal on yourself, and feel refreshed. you believe a bone has set back into place. This also gives a visual sign of your differences. As the other you is a bit hurt. Seeing Peaches heal herself Cobalt attacks the copy, hard the drone is revealed and appeared dead. You however don't strike soon enough and Fel Horn uses her wings to fly up, seemingly frantic to get away from you "I jussst sssurvive.."
"Everyone! Gather together for one last, great attack!" there isn't much to work with here, dead bugs aren't as inspiring as you would think, they're kind of gross.. oh and there is a bolt of magic hitting you in the face too, that might be the problem. you jump up and strike her with you great hammer, hitting her injured leg makes her come back down in pain, she is standing awkwardly on her back hooves using her wings to help her balance. "Ssstop.."
Cough up a bit and instead of risking it, heal myself. I pin her down with my hammer heft on her throat. you heal yourself from that blast. "For your mercy.. I could.. help.. tell your cryssstal princessss where the queen isss.." she offers. "I can be.. your ssslave? Poniesss like ssslavess yesss? " Keep healing, Cobalt is next. "Just tell us where she is!" She copies your image and voice "I can look like anyone, I can look like you, be your body double." "Fel Horn is not stupid. You will just kill me if I do that, or worse leave me here for her to come finish me off. No. I will only tell if you bring me to the city first." "And get a sneak one in on my partner?" Wince in disgust and punch her in the face. she winces and changes back to her true form. "ugh.."
The battle in the distance seems to be dying down. many changelings are retreating. Fel Horn looks in the direction they are flying as if she can hear something. Lean in and squeeze her neck with TK. "They're going back to the Queen." she squirms under your hooves and magic "the nessst its in the mountain.. pleassse let me go back.. ssshe needsss me.."
"Too late. But don't worry, we'll send her after you." she screams loudly in your ear deafening you, but your partner has you covered and stabs her in her heart, silencing the Changeling, her green eyes going completely vacant as movement and sound seize. "Glad that's over, she was really starting to bug me. I'll let you have the honor of reporting back, be sure to give me proper credit." he smiles and then vanishes, leaving you to clean up as usual. We should press on now." "Stupid changeling. That's what she deserves…"
"Maybe he's right, we can't attack the hive, just the 3 of us." And by the time she's dealt with, the others won't dare touch us." "I think we should report first. If we run in now and get captured, nopony will know where we are." "Oh well. Report it is then. Ready to follow." You go to the captain of the Crystal Guard who seems to have just finished talking to one the Crystal guards. "Welcome back, and good job out there, thanks to your help we have them on the run." "Sir, we know where the queen is hiding, now." The captain smiles at you "Really, where is she? I'll mount a team to go exterminate her as soon as we've recovered here." "She has a nest in the mountains. We should leave right away!" "Sir, with enough cover we might be able to penetrate their defences and hit the queen while the rest of the hive is distracted." "Getting past the whole hive will require a lot of pony power and my men are still not all back from the battle. We can leave tonight, give them a chance to eat and recover." "The hive is never distracted Peaches, their minds work.. differently. She probably called back her swarm for a reason and will be wary of anyone following them. I'll assemble my best and we'll go tonight. But, I must emphasis this, do not go in alone, is suicide and will alert her to move."